And now, for something completely different: collage! So…what I’ve been up to? I’ve been trying my hands on Teesha Moore‘s style. 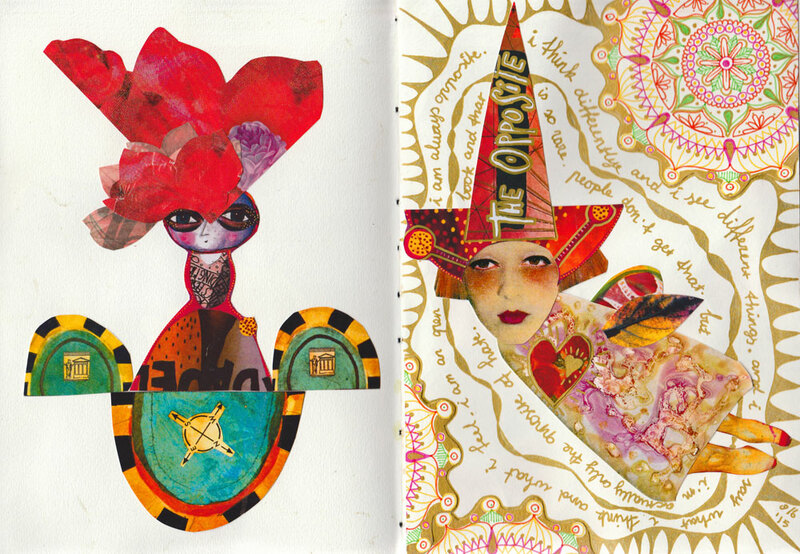 I love her art journaling work! But who doesn’t? Her journaling style is copied all over the world. No wonder. It’s colourful, quirky, funny, diverse and really makes your fingers itch. I don’t think there’s one art journaler in this world who hasn’t tried his or her hands on Teesha’s style. So had I…but thus far failed miserably in the process. I always got stuck. 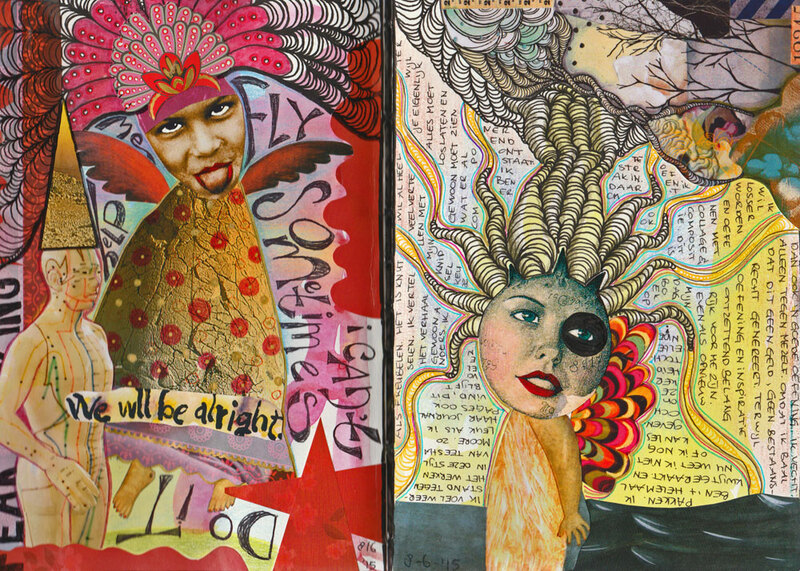 The thing that makes it hard, is that Teesha’s art journaling style is so intrinsically hers and so specific that it’s hard to mimic, give it your own touch and incorporate it in your own work like you can do with most other styles. As soon as you start working in that ‘Zettiology’ style of hers (Teesha used to design and sell quirky stamps under that name), your page becomes Teesha’s. Every art journaler will recognize her style from miles away. And that’s where frustration lurks because you can never be as good as the artist herself. When I google her name in images, her pages stand out from those by copycats, no matter how well they were done. I don’t want to be no copycat! Don’t try to tell a story! Page 1 became a disaster, compositionwise. And also, not very coherent. 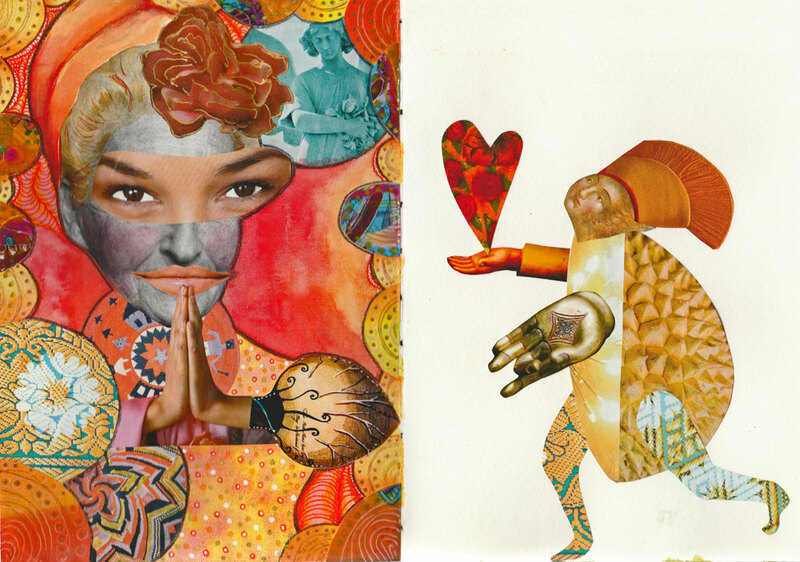 The thing is…Teesha makes these collages first, and then later completes the pages with colour and journaling. For me this process was a beginning-to-end-in-one-afternoon and as you can see, I struggled to tell a story. Also, Teesha says in one of her videos that initially she has no story; she just composes an image. I had been hunting for ‘the right’ image for hours when I caught myself being stuck in the story. Instead of letting an image grow and go from there, I was trying to force a preconceived story to appear before me…it’s clear that it doesn’t work. To cut or not to cut, that’s the question! Page 2 went much better because I worked on pages 2 to 6 at the same time. This page is pretty okay, I think. The only thing I feel a little unhappy about is the top right part, which is a massive collage element from one of Teesha’s collage sheets that I downloaded from theartstronauts.com (A really lovely paid member site that Teesha runs with her husband and that’s full of inspiration and creative pulse by them and fellow artists.) It was just such a wonderful piece that I didn’t want to cut it up. On page 3 grew a quirky collage figure, all right. But where to go from here with her? No idea! Page 4 I love! That’s a collage figure that grew without a preconceived story but ended up telling a story anyway. Cut one of my mandala’s up for the purpose (Why didn’t I think of making a mandala collage sheet instead? Silly me!) There’s some material experimenting on this page (the dress…you don’t want to know how I got that texture…and frankly, I don’t remember…it was an accident!) and lots of gold gel pen…yay! Page 5 is definitely Teesha style. It’s not done yet…still have to journal on it, but once finished anyone will recognize where I got my inspiration from. And as much as I love how the page turns out and how beautiful the colours are, I want to integrate this style into my own style…so the next page is an attempt of that! Page 6 I LOVE in capitals! This figure tells a story like you won’t believe. It’s the story of what I’m going through right now…carefully trying to keep a good balance for my heart with my other hand in a position that symbolizes hope and peace while the face looks up into the sky where she feels the presence of the scalpel of Damocles. (I might need heart surgery, you see…and ‘might’ perhaps reflects a little more perhapsness than what chances really are.) This little figure reflects how I’m feeling…I’m juggling with life, with fear, with hope and all the while I’m running on the fast lane that life is. This page is nowhere near finished, but it sure is on its way. I’m going to try and finish this page Mandy style. And make sure the figure stands out really well…let’s see if I can pull it off.